AUTOSTEM partners at Aston University have had a busy autumn schedule. Three Aston researchers have been active in disseminating the progress of AUTOSTEM and recent findings. Drs Petra Hanga and Shibani Ratnayake attended the BESIG IChemE Novel Technologies in Industrial Bioprocessing Meeting that was held at CPI Darlington, the UK on the 11th and 12th of September 2018. Dr Ratnayake presented a poster entitled “The development of a fully automated platform for the manufacture of stem cells for cell therapies”, and in fact, she won a presentation prize for her work at the meeting. Together Drs Petra Hanga and Naya Moutsatsou attended the Biopronet 5th annual science meeting that was held at BMA House, London on the 10th and 11th of October 2018. 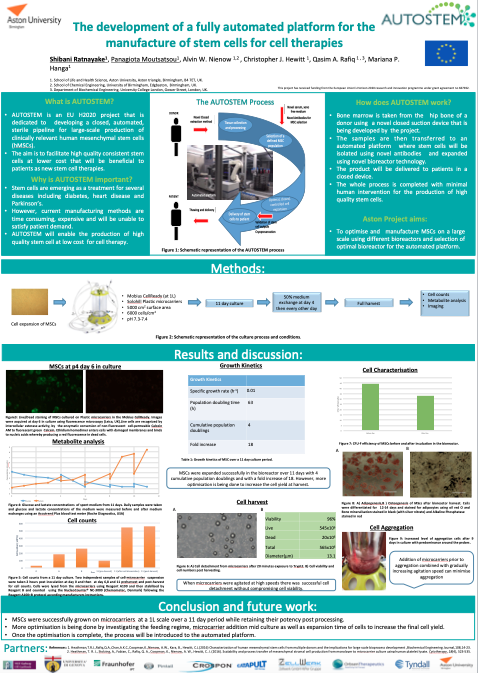 Naya also presented a poster entitled, “The development of a fully automated platform for the manufacture of stem cells for cell therapies“. This entry was posted in Dissemination, News, presentations. Bookmark the permalink.